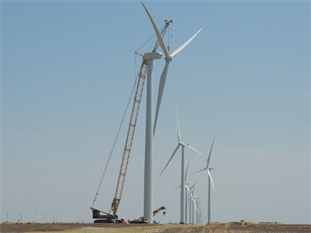 In 2012, OlsenBeal and Renewable Energy Systems Americas (RES) began contract negotiations for a large wind farm located near Ulysses, Kansas. Due to project contraints, the project was pushed into the next years (2013) construction season. In 2013, the 123 GE 1.85 WTG was approved for construction. OlsenBeal mobilized in May of 2013 and began receiving and installing WTG components in June. 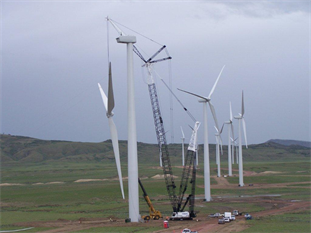 OlsenBeal was able to complete the project on time, even though there unseasonably wet weather created work delays and over 50 days of high winds shut down erecting operations. OlsenBeal finished the majority of the WTGs with a zero punchlist. Our crews worked long hours to keep the orignal scheduled completion date. In the end, the client was given a safe, high quality and on time installation. 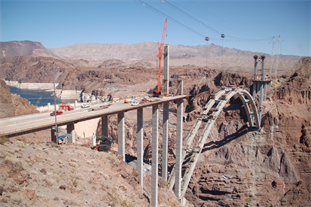 Boulder City, Nevada – In the spring of 2005 we were awarded a subcontract by Obayashi Corporation (Project General Contractor) to participate in the construction of one of the largest arch bridges in the world. The Hoover Dam Bypass Bridge has been in the works ever since the tragic day of Sept 11, 2001. Since that fateful day, interstate traffic has been greatly restricted for crossing the Hoover Dam. The Hoover Dam Bypass Bridge is now the 4th largest concrete arch bridge in the world. It spans the canyon just below the Hoover Dam. Our work scope included the erection of the 350’ tall twin cable ways that would carry the bridge material across the canyonal, rig and erect all the precast concrete columns, set all the horizontal steel tub girders, install the stay in place metal decking, and finally remove the twin cable ways once the bridge was complete. The Hoover Dam Bypass Bridge was recently opened. This monumental project and our success is attributed to our well seasoned work force and management teams. We completed this work safely and without incidents. 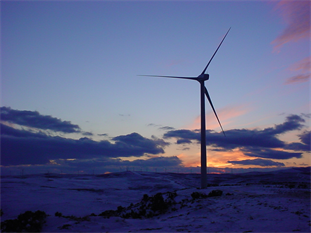 In 2008, OlsenBeal was contracted by Signal Energy to provide the erection services for the Flatridge Wind Project for BP. We installed 40 Clipper Liberty WTGs in the late summer and fall, completing the project on time, even though there were many delay challenges that had to be overcome. 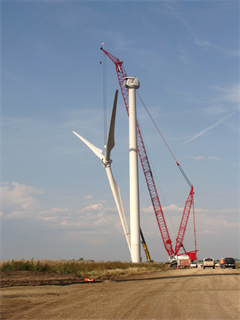 OlsenBeal has been installing Wind Turbine Generators for a large variety of companies for over 10 years. We have installed over 1,000 WTGs units in Western half of the United States. We have a very experienced team of skilled workers who know the work and do it safely and efficiently with a focus on quality. We have the expertise and experience to make your project a success. Contact us today. Western United States – As a company that specializes in heavy rigging project and as an owner of several large capacity crawler cranes, we have been contracted by several companies including Flying J, Holly Oil, Chevron JR Simplot and others to receive, unload, transport and set many extremely large and heavy vessels. We have lifted up to 700,000 lbs vessels with our specialed rigging and lifting equipment and with our certified riggers. If you have a project that involves wind turbine erection, heavy highway, heavy lifting, heavy / complicated rigging, or industrial work, contact us today. We have been working in these industries since our beginning in 1987. 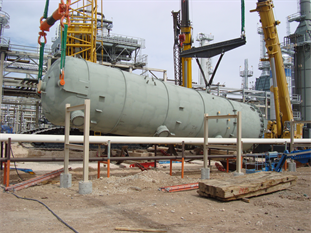 We have the expertise, experience, and equipment to meet your projects needs.